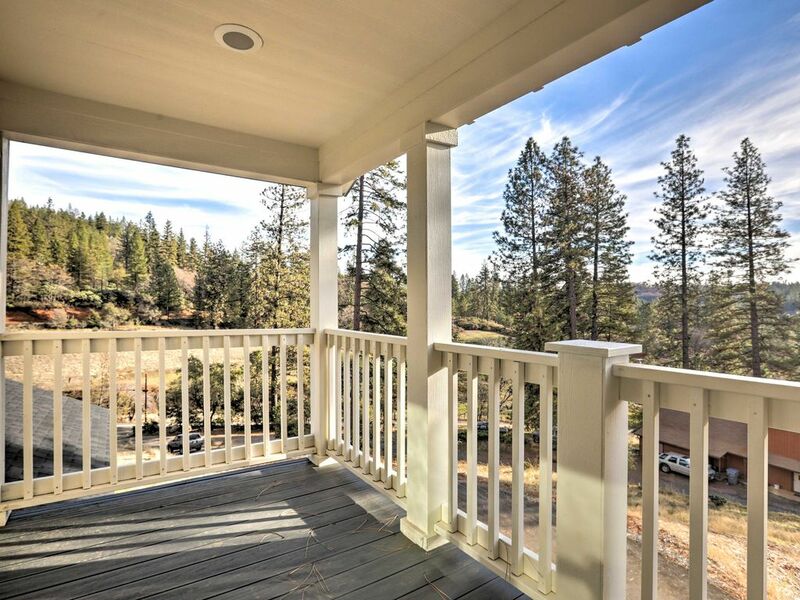 A Northern California escape awaits you at this bright and welcoming Colfax vacation rental home. With 5 bedrooms, 3.5 bathrooms, and additional sleeping accommodations including air mattresses and pullout couches, this home sleeps up to 20! The perfect home base for family or friends, there are plenty of activities and outdoor adventures in the surrounding area. Spend a day boating on the lake, trek nearby trails, hit the slopes for epic skiing, or explore the history in Colfax and Auburn! This home is great for family gatherings! With over 2,600 square feet of well-appointed living space, there's plenty of room to settle in and get comfortable. The living area features 2 comfy sofas and a futon - perfect for those cozy movie nights at home. During the day, warm natural light fills the room and creates a truly inviting space to relax. Step into the fully equipped kitchen to prepare a home-cooked meal. There's plenty of room in the spacious kitchen, so grab a helping hand for cooking and clean up. Gather around one of 2 dining tables inside, or take in the fresh air on the patio as you dine al fresco. There's even a gas grill - sure to add some zest to your favorite recipes. Everyone will get the rest they need for the next adventure, with 5 lovely bedrooms and additional sleeping available (2 couches, 3 air mattresses). The master bedroom boasts soft white linens, a flat-screen TV, and an en-suite bathroom. Make a day of visiting the Greenhorn Campground on the Northern Arm of Rollins Lake. Choose from a variety of water sports including swimming, waterskiing, and wakeboarding - even jet skis are allowed on the lake! You'll find boat rentals and floating docks for swimming. The anglers in your group are sure to love the excellent trout fishing on Rollins Lake. Cast a line to reel in Kokanee, catfish, and bass! If you choose to camp, boats can be moored for an additional charge. Looking for a fun activity to challenge the whole group? The house is very close to Bear River for gold panning - which is much harder than it looks. If you're planning a trip for the winter months, the home is just 30 minutes from cross country and downhill skiing! Warm up in the shops and restaurants of Colfax and Auburn after a day on the slopes. We had a wonderful experience staying in this home. Very clean, plenty of space to sleep a big family. The owners were very accommodating. We will definitely stay here in the future!